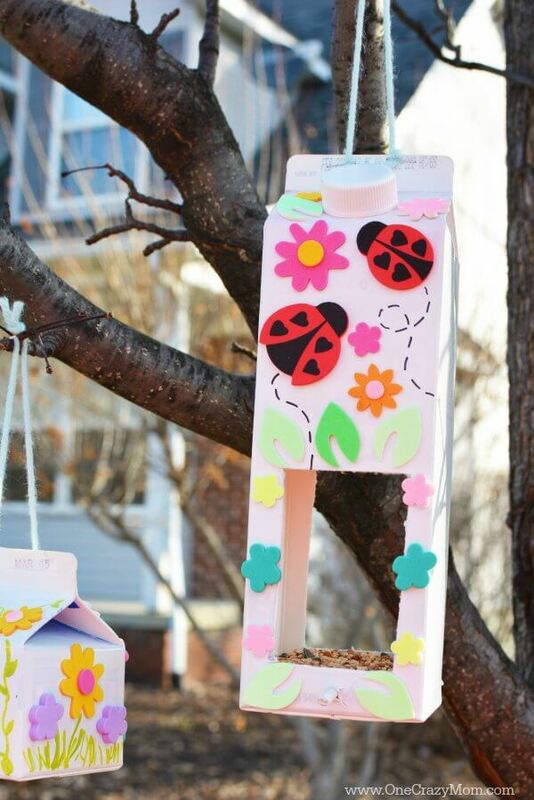 The kids will love helping to make this fun Homemade Bird Feeder! 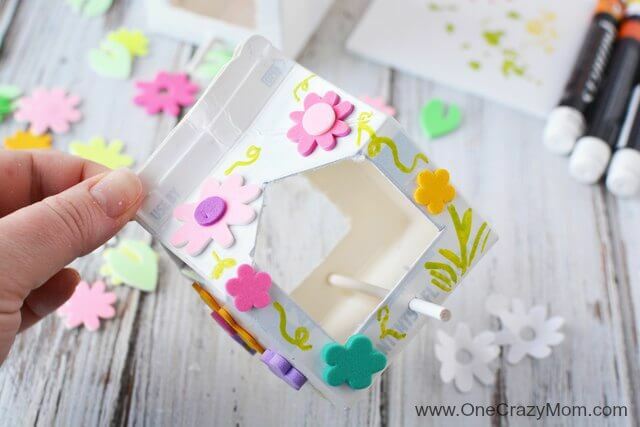 Save your old milk cartons and get ready to have a blast crafting! 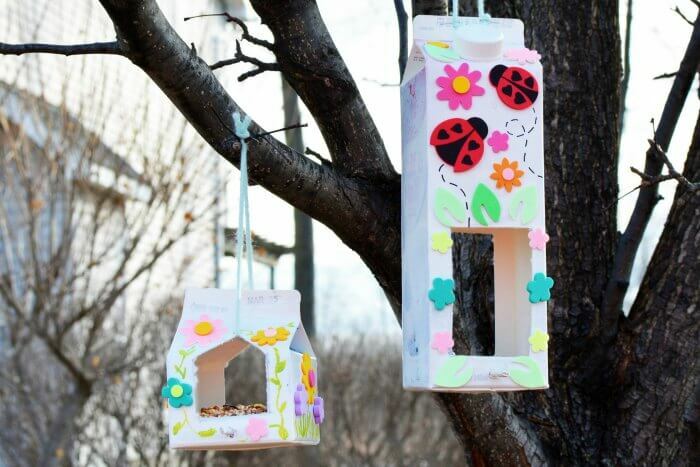 Embellish the DIY Bird feeder with stickers and more! Learn how to make a homemade birdfeeder with items you probably already have at home! So fun! 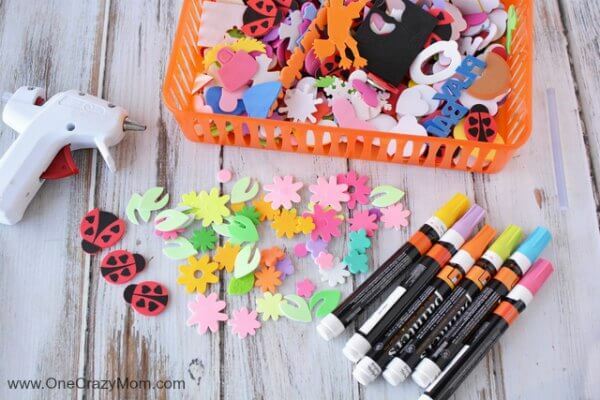 This is such a simple craft but will provide lots of fun for kids! Plus after you are finished making this DIY Bird feeder it will be neat to watch all the birds! 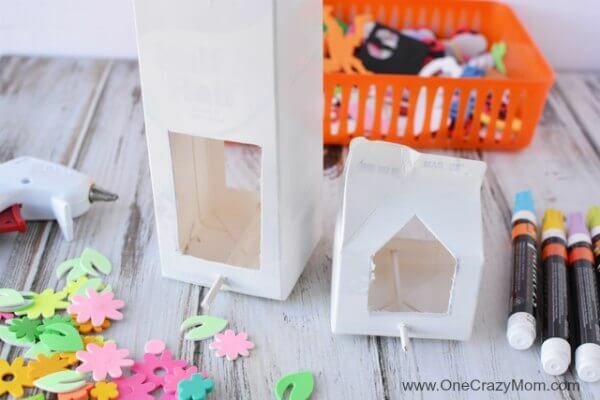 I always wonder what to do with leftover milk cartons and now we have the perfect craft to do. I think this would also work with half & half or creamer containers as well! 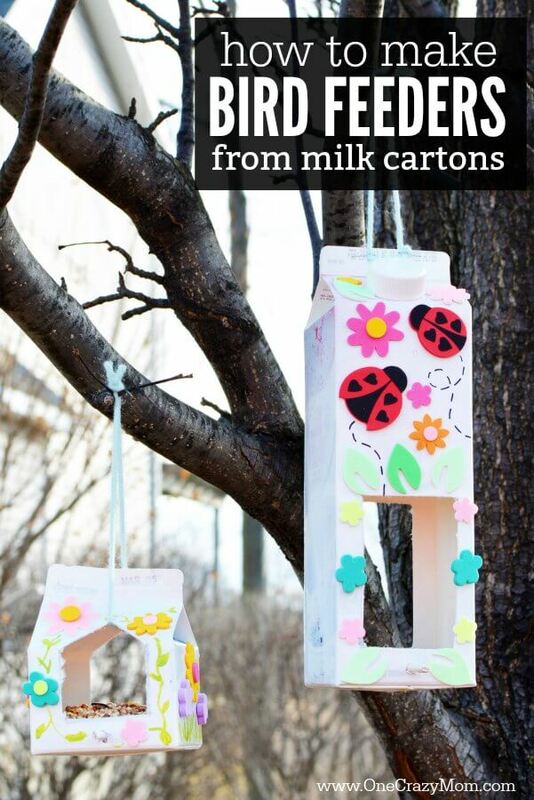 You could even save the small individual cartons of milk and make miniature bird feeders. I have also seen plastic bottles turned into bird feeders. There are tons of ideas to use what you already have! I love craft projects that don’t require a ton of new stuff. Let’s face it…..no one has the time or money to do that! That’s why this Homemade bird feeder is so cool! You most likely have all you need at home already. Yeah! 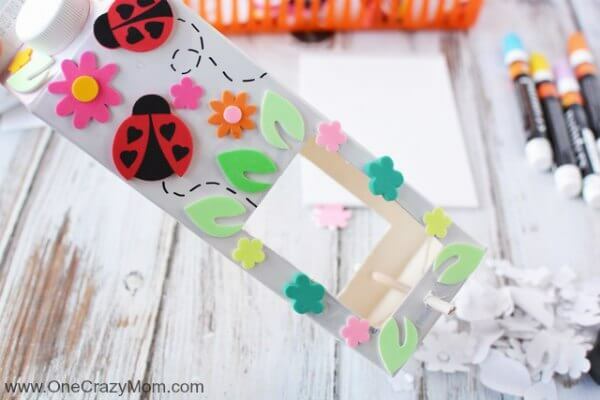 If your kids enjoyed this Easy Paper Butterfly Craft, they will love learning how to make a homemade birdfeeder! The entire family will enjoy being able to watch the birds. From birds and squirls and other feathered friends, this easy diy will have you spotting all sorts of cool things. We love seeing blue jays in our bird houses. So pretty! 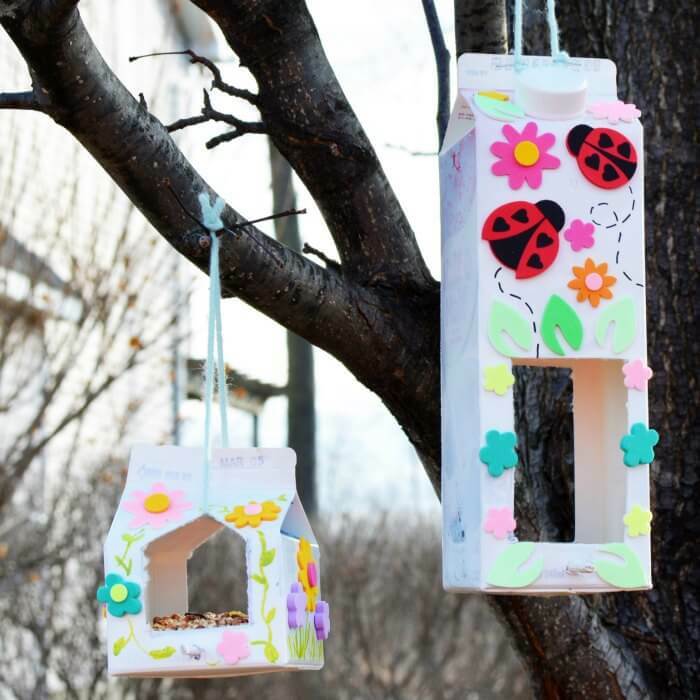 Give this easy bird feeder project a try! We enjoy making things and it’s a great way to spend time together. Lots of memories are created and we have a lot of fun in the process. These things don’t require a lot of money and it’s fun to do. It’s a great way to spend an afternoon at home! Have a picnic, enjoy the weather and make a day of it! Some of our most memorable days have been the days we don’t even leave the house! You can purchase a large bag of bird seed on Amazon. I like buying the big bags so I don’t have to keep going back to the store. Plus, it’s nice having it come straight to your house. I don’t have to worry about toting it around the store. Plus, I usually find a pretty good deal on the bird seed too. They have some gorgeous bird feeders too! I love watching the birds every morning. I have one right outside my kitchen window on a tree. It’s so pretty because when I’m washing dishes or just in the kitchen, I can see all the pretty birds. Have you ever made a Pine Cone Bird Feeder? These are fun and especially handy if you have a yard full of pine trees! This simple bird feeder is so easy to make and fun for the kids. Let’s get started with this DIY Bird feeder! 1. 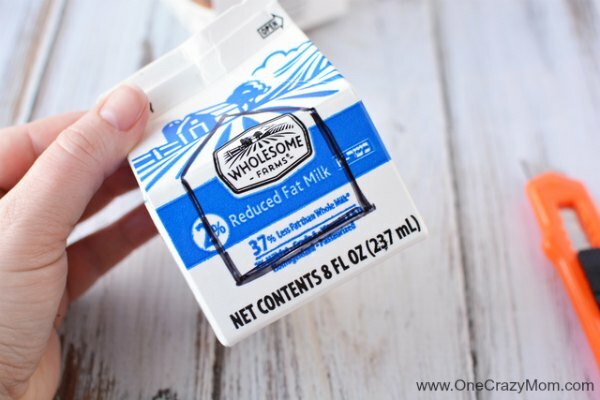 Use a permanent marker to draw a square or shape onto the side of the empty milk cartons. 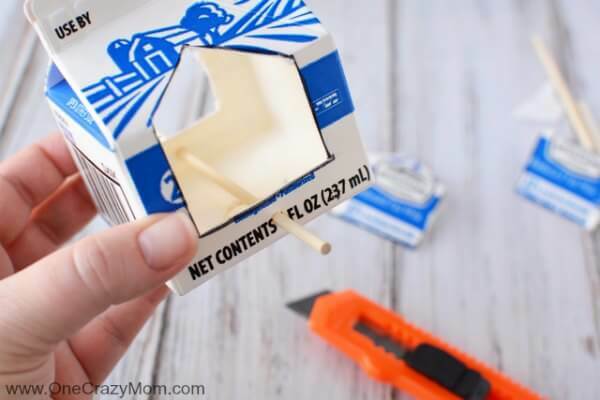 Use a utility knife to cut out the milk carton. Discard the insert. Use the tip of the utility knife to place a small x mark into the bottom of the carton (think of the X a straw goes into on a drink lid). Repeat this process on the opposite side of the milk carton. 2. Slide a bamboo skewer into the milk carton pushing it out the X mark on the opposite side. Trim the bamboo skewer with diagonal cutters so there’s about a 1″ length on each side of the carton. 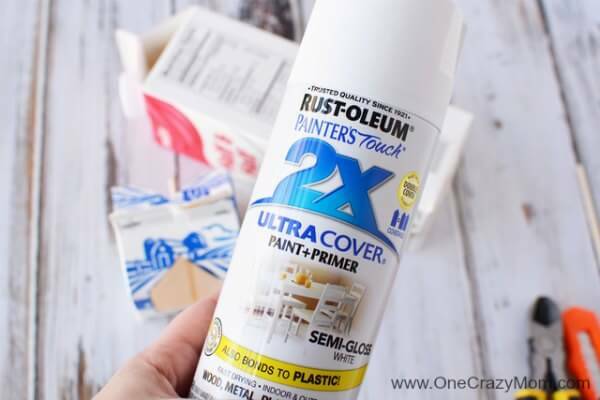 3.Use spray paint to paint the carton white or any color you desire. Let dry completely. Multiple coats may be necessary to cover the writing on the carton. We used Rust-Oleum paint + primer. 4. 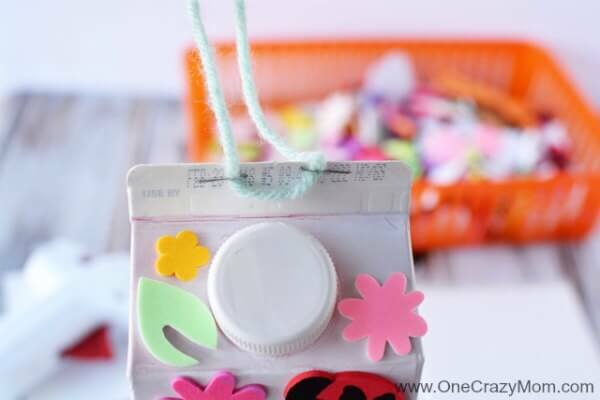 Decorate your milk carton with foam stickers, using a hot glue gun to attach if not using adhesive foam stickers. Add accents with paint pens, too. Decorate however you like! 5. Use a piece of yarn to attach to the milk carton to hang the bird feeder. Staple the yarn to the milk carton if necessary. This step tends to make it more secure especially if there are winds. 6. Add some bird seed in the center of the bird feeders and hang outside for the birds to enjoy. 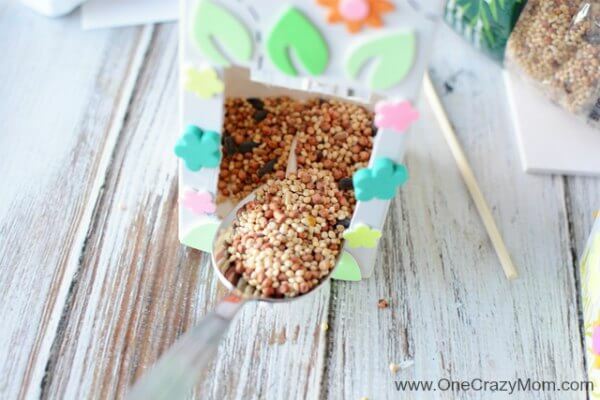 Sit back and watch the birds enjoy this yummy bird seed in their new DIY Bird Feeder! Now that you know how to make a homemade birdfeeder, it’s so fun and simple! 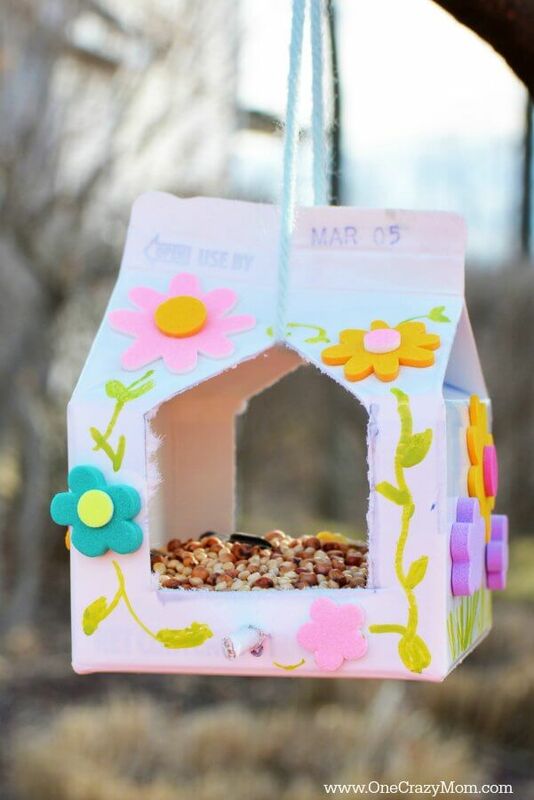 This milk carton bird feeder is so easy and it’s neat to decorate it. Homemade hanging bird feeders work just as well as store bought for much less money. Plus, it’s just more fun to make a milk jug bird feeder! The kids will love decorating their diy bird feeder. It’s fun to see how each child decorates their bird feeder. You really get to see their personality and imagination come alive. 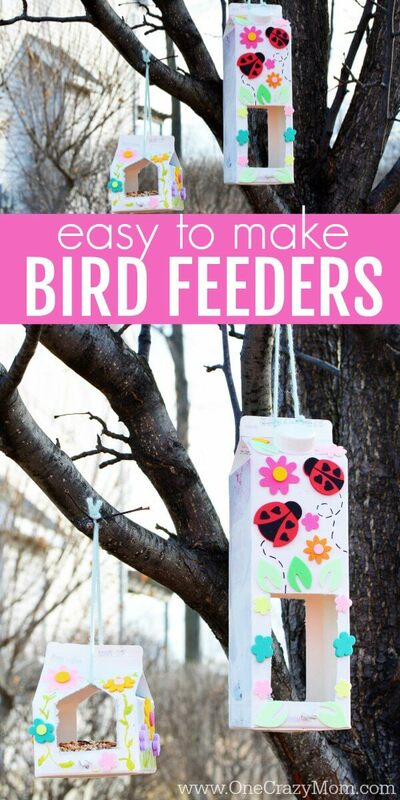 Give this easy bird feeder a try today! Pine Cone Bird Feeder– this is an easy one because you just need to fine some pine cones! Learn how to save money at Hobby Lobby!